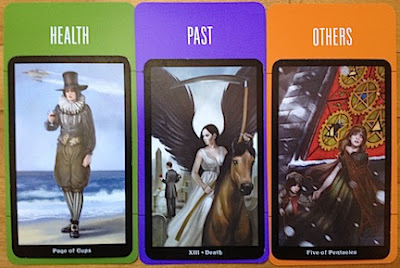 This spread features Barbara Moore's Steampunk Tarot. The three positions she got were kind of weird at first glance. But she went through with the reading anyway and, as it turned out, they led to perfect answer for her. She said the result was proof that "tarot rocks and the Deck of 1000 Spreads rocks right along with it. It helps me ask the questions that need to be asked, even if I don't consciously know what they are...until the cards are revealed." This part about asking the questions that need to be asked is a good point about the Deck of 1000 Spreads. When you choose spreads at random like this, my experience has been the same as Barbara's. At first, the selection of cards you're given can look odd, but just go with it and see what reading you get. If it doesn't work out, you can always choose more cards for clarification or detail or whatnot consciously from the deck. But choosing spread cards this way leverages that same "magic" that you get from randomly drawing tarot cards. It gives you what you want even if you don't know what that is.